and this photo of Olive trees. Photos EAPPI/A. Aguilar. It’s 6AM. We are overlooking the Jordan Valley while the sun rises and throw it’s sunbeams over an olive tree covered landscape. It’s quiet. We have no need to talk to each other. We just look. Enjoy. The view over the Jordan Valley takes your breath away. Beautiful. I can’t find other words that can describe the small village of Yanoun. An EA photographs Israeli settlement outposts on the hills surrounding Yanoun. Photo EAPPI/A. Aguilar. The morning sun lights up the entire valley. But a shadow still covers Yanoun like a lid. Our eyes move along the horizon. We see some buildings on the hilltops that surround us. They are Israeli outposts. Outposts are expanding settlements on Palestinian land that the Israeli government has not legally approved. They are illegal according to both Israeli and international law. Two such outposts surround Yanoun. Givat Olam and Hill 777. The reason we do morning walks is not to take in the beautiful scenery of the Jordan Valley, but to provide protective presence. This created strong international reactions, and since 2003 EAPPI has been present in the village. Unfortunately, settlers and soldiers keep on harassing the villagers and make life difficult. A flock of sheep in Yanoun. Photo EAPPI/A. Aguilar. We feel the tense atmosphere in Yanoun. It is a strange mix of peacefulness, unpredictability and fear. On the hilltops around the village, the settlers constructed watchtowers and huge spotlights that light up the village every night. Freedom of mobility is limited. Settlers wash their dogs in the village’s drinking water. They attack the village regularly. And the duty of the Israeli soldiers is to protect these settlers. As a result, there are only 70 villagers left in Yanoun. It is recess at the village school. The seven pupils play with a ball while I drink tea with the teachers. We joke about each other and about the neighboring village. Life goes on and it is important to keep your head up. EAPPI, Israeli, and other activists help build shelters for residents of Mak-hul after the demolition on September 20th. Photo EAPPI/R. Marques. In the middle of last century George Orwell foresaw that “Big Brother” would dominate our lives completely. In his book “1984”, the author tells the story of a fictional country controlled by a government matrix that decides from the clothes you will wear to what kind of information you can get from the media. The control is justified by the constant threat of an external enemy that you have never seen. Those who are controlled seldom realize this. In the context of the Israeli occupation, the awareness of the Israeli people about what is happening is amazingly close to zero. But for every rule there is an exception. The community of Mak-hul, in the Jordan Valley, Palestine, was demolished on September 16th, affecting at least 12 families. On September 20th, several organizations joined efforts to deliver shelter and tents to the village through the Agency for Technical Cooperation and Development (ACTED). EAPPI joined the delegation to provide protective presence to the community and help with the shelters. Several diplomatic representatives were also present. The army took the truck with the humanitarian aid by force. 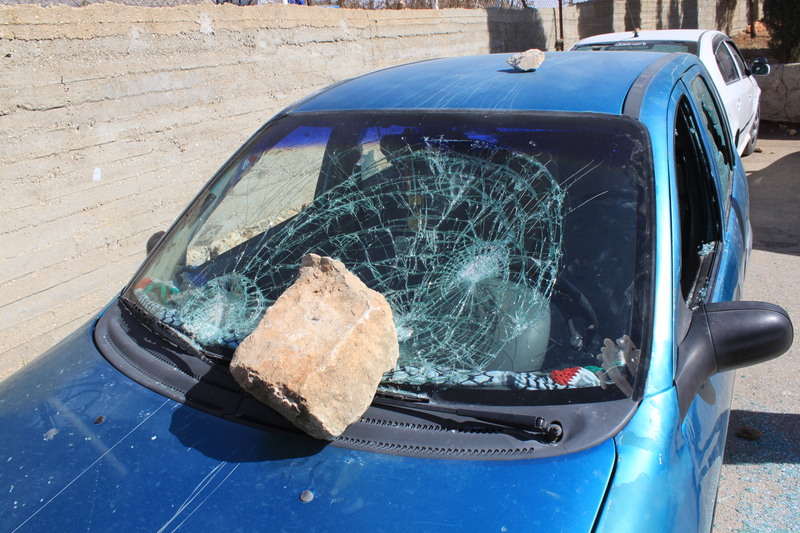 Some clashes then occurred between the villagers and the army. On October 11th, we returned to Mak-Hul to help build shelters for the animals and some tents. This time, several Israeli activists, especially from the organization Machsom Watch, came to the community to deliver materials and offer help. Most of them were elderly. In one conversation, one of the activists said that several members of her group have been arrested for being in Palestinian areas. She herself had been arrested. After that, she decided to seek the Israeli administration responsible for the occupation, and there she was forced to sign a document taking all responsibility for visiting areas considered “dangerous”. The entry of Israeli citizens in these areas is prohibited by Israeli law. For its citizens, the Israeli government justifies its actions as measures necessary to guarantee security. For Palestinians, the Israeli activists are always welcome. Among Israelis in Mak-Hul, we found Mr. Yehoshua Rosin, now 70 years-old, who, early on, decided to oppose the occupation and the decisions of his government. Mr. Yehoshua asked us to email the photos we took that day. He, then, told us a beautiful story. Seeing the familiar apoplectic Facebook posts in response to a strike by tube train drivers in London this Christmas I was reminded of my first visit to Yanoun. We alighted from a service (minibus taxi) at the Za’atar junction, a busy roundabout on the edge of the city of Nablus, and our Brazilian guide Alex, from the preceding EAPPI group in Yanoun, gave us our first lesson in the transport politics of the West Bank. “Settler bus stop” he said, pointing to an empty shelter with a bench, set back from the junction on a paved area, with two large concrete blocks in front of it. “We will wait there.” He continued, pointing to a group of Palestinians stood in the road about 30 feet ahead. As we walked around the shelter, I took in the guard tower positioned behind it. Though I was a little slow to gather the implications of this set-up, it sank in eventually. 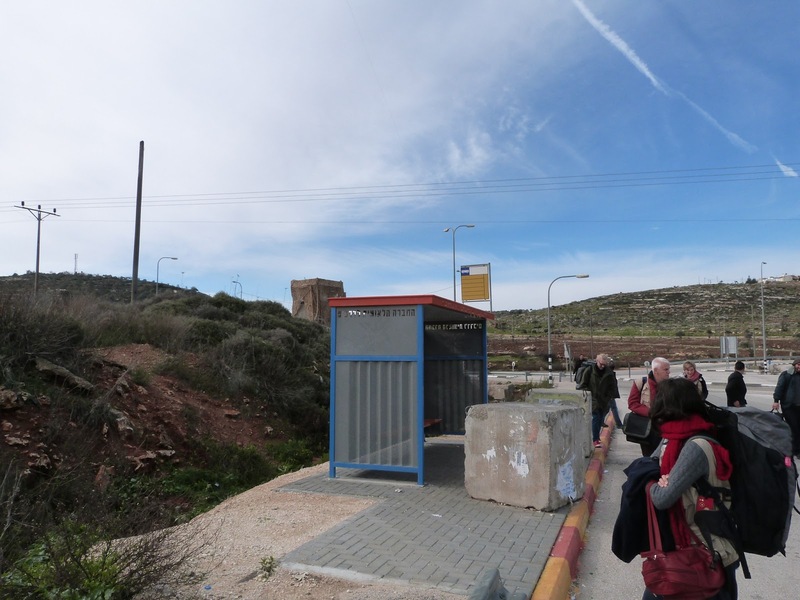 Jewish Israeli Settlers (in this instance mostly from Tappuah settlement, which overlooks Za’atar) in this area have their own bus stops, which Palestinians are restricted from using, with the threat of force used to ensure compliance. Thus the Palestinians wait on the busy road itself, unprotected from the elements, to catch buses or taxis. 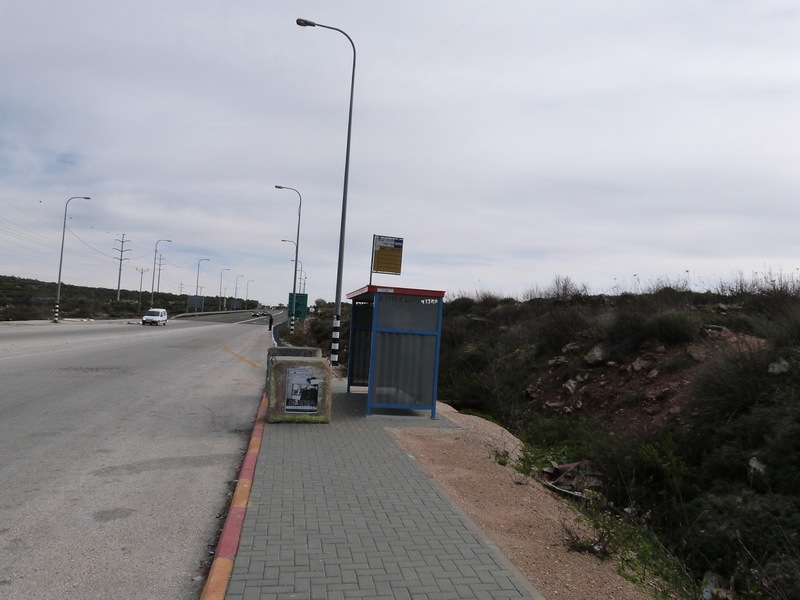 EAs pass the bus stop at Za’atar Junction. The manned guard tower overlooking the stop is visible in the background. There are a number of bus services that exclusively serve settlements and facilitate the movement of Settlers between the occupied territories and Israel, effectively discriminating against Palestinians and bolstering Israeli support to Israeli settlements that are illegal under international law. Both the settlements and the measures taken to protect and sustain them violate the human rights of Palestinians. This reality is unavoidable, even when one wishes to do something as simple as catch public transport. Whatever the tube’s shortcomings, I know which system I prefer. The ‘Settler’ bus stop at Za’atar. A Palestinian man waits by the roadside in the far distance.